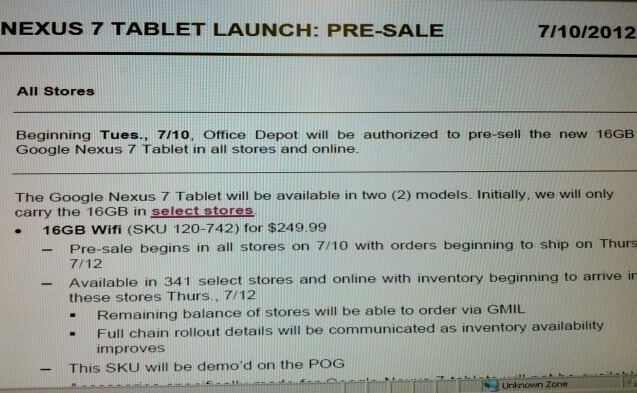 Office Depot Expecting to Have In-store Nexus 7 Stock by July 12? We saw the Nexus 7 shipping schedule change this morning to “1-2 weeks” in the Play store, but will 3rd party retailers receive it as early as this Thursday? According to Office Depot, they are expecting to have them in some 341 stores by July 12. Potential customers can pre-order through them starting today either online or in-store, however, if they won’t ship until Thursday, you might as well cruise into a store in 2 days and walk out with one the same day. I would recommend that you call your local OD to make sure that they have them. If you missed our Nexus 7 review, be sure to check it out.